This month we present some interesting utilities for enhancing your command-line experience. * YunoHost – A cool Linux alternative that easily installs an array of important server applications. * Lightpack – Check out this weird technology that lights up the wall behind your TV. * Over at Linux Voice, you'll learn about the new apt package tool and how it differs from apt-get. We'll also show you how to calibrate your monitor with DisplayCAL. The print edition is sold out. To purchase the digital issue, please click here. Tired of the same old Bash? We explore some helpful tools for extending and expanding your shell experience. 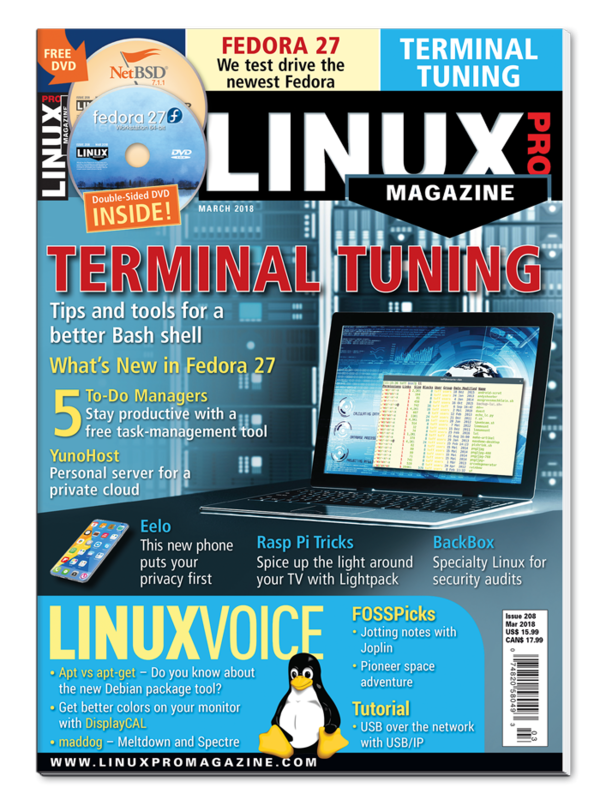 Fedora Linux is a favorite of developers, sys admins, and tech-savvy users. We check out the latest release. Busy people have busy calendars full of appointments and tasks. Linux to-domanagers help manage the clutter in a controlled way. A hidden utility in the LibreOffice toolbox, unoconv offers a wide array of import and export filter options. Specializing in security and forensics, BackBox Linux is ideal for vulnerability assessment, but it also works well as an everyday desktop distribution. Charly uses the Tsung load generator instead of human users as beta testers. Ambilight lights up the wall behind Philips TVs with LEDs mounted on the device to enhance the onscreen visual impression. All you need is Lightpack and a Rasp Pi. KiCad helps you design printed circuit boards with up to 32 layers and supplies schematics and assembly diagrams in the popular Gerber format. Mandrake creator, GaÎl Duval has big plans for a free-licensed phone. A serious security problem requires your attention. The apt command-line utility is a successor to the well-known apt-get, offering simpler installation and maintenance for the DEB packages used with Debian, Ubuntu, Knoppix, and many other Linux distros. If you're tired of inaccurate colors on your monitor, try calibrating and profiling using a colorimeter and DisplayCAL. USB/ IP lets you use USB devices connected to other machines as if they were plugged directly into your computer.